Our Daisy-girl passed away from congestive heart failure, on Tuesday, March 21, 2006. She is survived by her loving parents, Colin Sewell and Susan Heming, and her 4-legged stepsisters, Maggie and Mouse. As well, she will be dearly missed by her special furry friends, Kaya, Yanna and Hailey. Daisy was a unique cavy, arriving at our home as a wee baby, along with her litter-mate, Abigail (predeceased). Daisy loved all fruits and veggies, plus wild grasses, the occasional fruit tree branch, and yes, also carnations (on one very, very rare occasion). She also enjoyed snuggling in front of the TV with her humans, while snacking on almonds and parsley. She was physically active until her last few days, and always enjoyed exercise-time at home. Sometimes she’d follow her humans around the house, like a loyal canine. 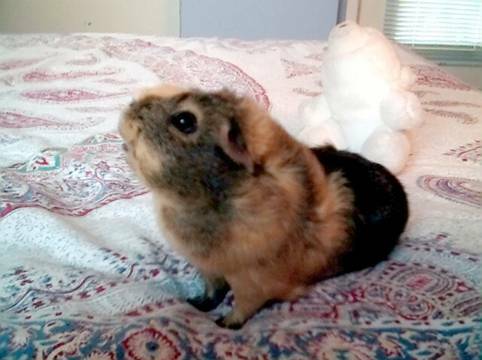 Daisy, aka “Monkey girl”, lived a long and full 7-1/2 years, and traveled extensively (for a guinea pig!) to such destinations as Harrison Hot Springs Resort & Spa and Manning Park Lodge, as well as visiting Vancouver Island via BC Ferries. Daisy’s passing from this world was as pain-free, loving and kind, as possible. Our thanks to Dr. John Anderson and his staff for their compassion and understanding. We imagine that Daisy’s in guinea pig heaven now, munching on fresh clover in gentle sunshine. Maybe Daisy even has a boyfriend (gasp!) in her cavy-afterlife. Daisy was a dearly loved pet, and is sorely missed, but never forgotten, by Colin and Susan, and by those who knew her.